Dr Val Has a New Home! I started this quilt at the suggestion of my blog friend, Dr Theresa Chan (rural doctoring). The post on it’s origins can be read here. 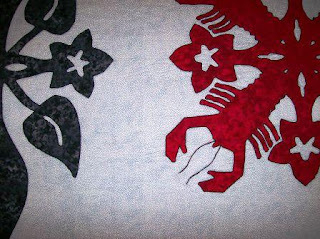 As I explained there, I enlarged the lobster pattern I found here (link removed 3/2017) and then “blended” it into the “Hoya” Hawaiian appliqué block. The Hoya block I found in a book I have called Hawaiian Quilting by Elizabeth Root. For the border, I again used the Hoya block and added the leaves from the Anthurium block for the center area of each border. The corners are the Angel’s Trumpet block. All three blocks can be found in the Elizabeth Root book. The quilt top is now basted to the batting and backing. I used the “fusible” Warm and Natural batting. Here is a close view of the lobster with his antennae. 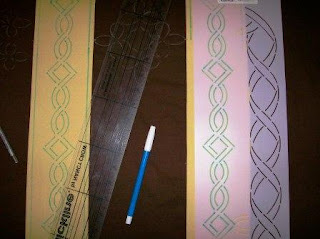 The machine quilting will be both outline and echo. Here I have taped around the center in preparation to do the first echo. So Theresa put on your thinking cap. When it’s finished how are we going to auction it to raise the proposed money for Zippy and children’s brain cancer research? Updated 3/2017 -- photos (except my own) and all links (except to my own posts) removed as many no longer active and it was easier than checking each one. This past weekend, Kevin MD, told us about Sharpie’s actually being anti-bacterial. Surgeons use markers to identify the right body part for procedures. Unfortunately, they care become contaminated with bacteria which can lead to surgical site infections. Enter the Sharpie: "As it turns out, the ink used in a Sharpie pen has an alcohol base, making it an unexpected germ fighter." …. That’s nice to know, but mostly what I got from the report was the reminder to clean the tips of the reusable markers with an alcohol based wipe between patients. For me the marker helps me in my planning, not in my germ control. Here is my post on marking/markers from last December. The skin marker should be nontoxic and non-allergenic. If used during the procedure, then it must be sterilizable. The ink must have a visible color and must be non-reactant with other chemicals used on the skin (e.g., povidone iodine). The ink must be resistant to mechanical cleaning but removable in time. The information immediately below is from the first reference article. If Dermabond is used, it is best to avoid use of antibiotic ointments as these can “dissolve” the bond before the cut is healed sufficiently. 5) achieve a satisfactory cosmetic appearance. How these goals are achieved will depend on the amount of tissue lost, whether there is bone exposed, and which finger is involved. It may also depend on the patient’s profession or hobbies (ie professional musician who may not tolerate decreased sensitivity to his long finger whereas a truck driver might not notice it). Injuries may also be classified according to where the amputation has occurred or whether the injury primarily involves the pulp (soft tissue) or nail bed. These classification systems refer to the zone (photo credit) and the plane of injury. Soft-Tissue Injuries of the Fingertip: Methods of Evaluation and Treatment. An Algorithmic Approach; Plast. Reconstr. Surg. 122: 105e, 2008; Lemmon, J. A., Janis, J. E., Rohrich, R. J. Nail Lengthening and Fingertip Amputations; Plast. Reconstr. Surg. 112: 1287, 2003; Adani, R., Marcoccio, I., and Tarallo, L.
Kim, Emergiblog, is this week's host of Grand Rounds. Nice edition! You can read it here (photo credit). Welcome to the Emergiblog Speedway, where the Grand Rounds 500 is about to get underway! No chance of a rain delay - our bloggers are ready to roll! Thirty-nine bloggers have shown up for the event. All entries have qualified; no posts were sent back to the garage. And ladies, don’t worry, you’re welcome on the track, I just wanted to use the classic starting phrase! Life is so fragile. Please, lend your support to Dr. Smak as her son’s brain cancer has returned. You can go here or here to donate money towards pediatric brain cancer research. JeffreyLeow, Monash Med Student, will be taking part in the adventure race, Anaconda Lorne, in Dec 2008 after his exams. The organizers have helped set up a fund-raising website through which anyone can donate. Please consider donating through this link. The donated money will go to the Burnet Institute. any additional fundraising that can be achieved helps the Burnet Institute fight some of the world’s most deadly infectious diseases through medical research and public health education, both here in Australia and overseas. To find out more about the Burnet Institute and their work, click here. Paul Auerbach, MD, Medicine for the Outdoors, has a nice post on the field management for a penetrating ("sucking") chest wound. The usual teaching for improvisational management of chest wounds is that all open wounds (particularly those in which air is bubbling) should be rapidly covered, to avoid “sucking” chest wounds that could allow more air to enter the pleural space and thus continue to worsen a collapsed lung. For a dressing, a Vaseline-impregnated gauze, heavy cloth, or adhesive tape can be used. The dressing should be sealed to the chest on at least three sides……. Alvaro Fernandez, The Brain Fitness Authority, hosts the first edition the first edition of MetaCarnival: a Carnival of Carnivals. Check it out here. Welcome to the first edition of MetaCarnival: a Carnival of Carnivals (announced here), the new, monthly, and interdisciplinary gathering of blogs and blog carnivals. Let's picture all participants in the shadow of an expansive sycamore tree, conducting a lively Q&A lunch discussion. This post is a review of several articles from Medscape on the 2008 Breast Cancer Symposium. It will just give you some of what I thought were the highlights from the articles. I have listed the articles with links for those of you who wish to read the full articles. These include not only those related to BRCA1 and BRCA2 mutations, but also other genes whose roles have yet to be fully defined. CDH1 mutations are associated with a lifetime breast cancer risk of about 40%, as well as with diffuse gastric carcinomas, and CDH1-related carcinomas are usually of lobular histology. The lifetime risk of breast cancer for individuals affected with Peutz-Jeghers syndrome is 45%. Patients with Li-Fraumeni syndrome have a higher incidence of radiation-induced cancers, and consideration should be given to mastectomy rather than breast-conserving therapy and radiation for the treatment of early breast cancers in carriers of this mutation. The American Cancer Society recommends the use of annual magnetic resonance imaging (MRI) screening in addition to standard annual mammography in women with a lifetime risk greater than 20% of developing cancer or in those with a history of chest irradiation. Type 2 diabetes mellitus is an independent risk factor for breast cancer, and patients treated with metformin have a reduced incidence of breast and liver cancers. There is considerable heterogeneity among triple-negative breast cancers. Indeed, these cancers can include, if rarely, disease metastatic to the breast, medullary carcinoma, pure apocrine carcinoma, and some metaplastic breast cancers as well as tumors defined by gene expression profiling as "basal-like" breast cancers. It is hypothesized that in the absence of the normal BRCA1 DNA-repair mechanism, BRCA-deficient cells are more likely to use the polyADP-ribose polymerase (PARP1) DNA-repair pathway. Preclinical experimental evidence and hypotheses of self-seeding raise the notion that perhaps we should be more aggressive about the local control issue in more patients with simultaneous distant metastases. ER, PR, and HER2 Status in the Primary Tumor and Distant Metastasis: A Moving Target? When patients are suspected of developing metachronous distant metastases, the dictum most oncologists are taught is "settle this issue and get some tissue." Biopsy confirmation of metastatic disease is the rule rather than the exception. At Memorial Sloan-Kettering Cancer Center, we have a unique set of matched breast primary tumors and brain metastases from patients who underwent medically indicated craniotomy; we have observed very high concordance in HER2, ER, and PR status between the breast primary and brain metastases (Brogi E and Seidman AD, unpublished data). Brufsky and colleagues reported on a prospective, observational study of 1023 patients with newly diagnosed HER2-positive metastatic breast cancer. Of the 1009 patients included in the analysis, 337 (33.2%) experienced CNS metastases at a median time of 12.8 months from metastatic diagnosis. Resident Anesthesiology Guy, "The Choloform RAG" (photo credit), is our host for this edition of SurgeXperiences. He did a very nice job which you can read here. Thanks for the submissions. I think this will be another great edition and will be my very first, both in submitting as well as in hosting. I know that some hosts like themes or stories before they get to the submissions. I will, instead, just let the authors do the talking for this edition with some distinction between the specialties so you can go where you're most likely to read as well as peruse the minds of those around you. The next edition (210) will be hosted by From Dupont to Abdoun on November 9, 2008. The deadline for submissions is midnight on Friday, November 7th. Be sure to submit your post via this form. 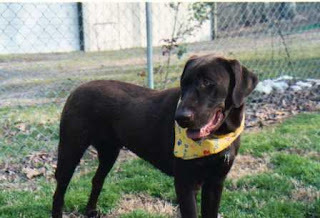 Our local humane society (Pulaski County Humane Society) began publishing a Day Planner in 2005. It has turned into a very good fund raiser for them. This past Thursday night was the debute of the 2009 seen here. I ordered several that first year to give as Christmas presents. They were such a big hit the first year, I've had to keep doing it. You can read my post from last year on these day planners here. The planner makes an excellent holiday or birthday gift and will be available at outlets soon to be listed below for ONLY $25.00! This year there are over 200 heartwarming photos of pets and their owners in a highly stylized, sturdily bound planning calendar. 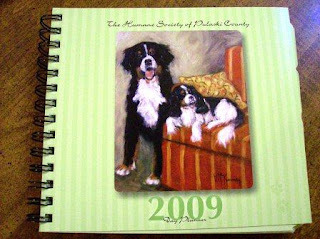 Help the Humane Society of Pulaski County and get yours in time for Christmas and stay up to date in 2009! But why wait? You can place your order now to receive your books in November, using this MAIL ORDER FORM. (Depending on your browser, you may need to right-click on ORDER FORM and select 'download' or 'save'). Please print the form, complete it, and mail it to the address included in it. This year Rusty has his picture in the day planner. 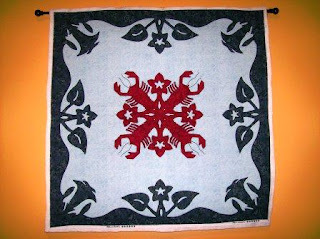 TBTAM sent me a quilt block (bear claw pattern) she found while antiquing. I have long admired the New York Beauty quilt block. Her small gift gave me a reason to “tackle” the block and make a small quilt using it. I did okay, but even using paper piecing some of my points and connections aren’t as nice as I would like. When I critique my quilts, I sometimes feel as if it’s my own form of M&M. Despite the imperfections, here it is. 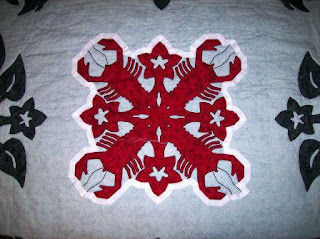 I machine pieced it using the paper piecing method. The small quilt is 24.5 in X 24.5 in. The suggested colors (by TBTAM) were red, yellow, blue, and black. They are all here, though just a small amount of blue. The quilt is both hand and machine quilted. This detail photo actually shows the colors better. My husband and I are going to vote today. We plan to take advantage of the “early voting”. I find it much easier than trying to get out and vote on the first Tuesday of November. It is less crowded and I don’t have to worry about going to the “correct” location. You are allowed to go to any of the available locations in your county during the “early voting” period. I will not tell you who to vote for, nor will I tell you whom I plan to vote for. I would like to encourage you to VOTE. To check for a polling site in your area, visit the Secretary of State's website (click here) to contact your county clerk. Last week my friend and fellow blogger Vijay (Scan Man) asked me for information regarding organ donation in the United States. He was preparing a talk for a local Rotary Club to try to increase organ donation in his country. My Oct 13th issue of the AMA News arrived a couple of days later and had an article on the same issue here – trying to increase the number of organ donations in our own country. The article is “Other Nations, Other Answers”. I think it is a free, open link, but in case it doesn’t here are the highlights. In late September, 99,728 people were on the United Network for Organ Sharing waiting list. One waiting patient dies every 73 minutes. Three in four waiting patients need kidneys. Iran has the world’s only legal, regulated system of kidney donor compensation. They claim to have nearly eliminated their country’s waiting list. Iran implemented its unique kidney donor compensation system in 1988, and by 1999, the wait for kidneys was eliminated, according to a study in the Nov. 1, 2006, Clinical Journal of the American Society of Nephrology. By the end of 2005, nearly 20,000 kidney transplants had been performed in Iran, with more than three-quarters of the supplied kidneys coming from unrelated living donors who were paid. Spain, by law, presumes organ donation after death unless the individual said otherwise while alive. Their cadaveric organ procurement rate is 35% higher than ours. If the U.S. could do what Spain does with its presumed-consent law, the U.S. would net nearly 14,000 more organs a year. Extreme poverty, endemic corruption and a growing demand for transplants, especially of kidneys, have allowed black market trafficking to flourish in countries such as the India, Philippines, Pakistan and South Africa. This unregulated trade is universally condemned, as there is no assurance that donors are treated well or that recipients get healthy, matching organs. On the black market, donors are often paid as little as $1,000 for kidneys, which sell for nearly $40,000. The American Medical Association is examining solutions to the organ shortage. The AMA favors studying presumed consent as well as compensation for families of cadaveric organ donors. The Association will lobby Congress to change the 1984 National Organ Transplant Act, which bans "valuable consideration" in exchange for donation, to allow for ethically designed trials of financial incentives. I am an advocate of organ donation. My driver’s license is states that I wish to be an organ donor. I would have no problems with doing as Spain does and making everyone a “presumed” donor. I applaud the AMA for pushing for ethically designed trials of financial incentives. Christian Sinclair, M.D., Pallimed, is this week's host of Grand Rounds. Nice edition! You can read it here. Nursing school is hard work. We all had our good days and our bad days, but we somehow made it through nursing school despite our bad hair days. Check out this picture. That’s me taking care of Snoopy back in 1977. Thank God I had my cap to cover that hideous perm! I got this picture out of my school yearbook. Pictures from yearbooks can do a couple of things. They can come back to haunt us as well as teach us about the history of the nursing profession. You may wish to watch this video before you read further. If not, do watch it afterwards. It's brilliant. Just over two minutes. Back in August, a fellow quilter,Helen in the UK, had a nice post on "A Little Something Different". In it she shared a pattern for a burial gown and bonnet set for a female preemie. Recently she shared the pictured (photo credit) burial garment for male preemies/newborns. Most local hospitals will have a need for something like this. Call and ask yours if you are interested in addressing this need. When I showed burial garments before a couple of people were interested in the patterns. I'm afraid to say the pattern I used for the boy suit, by Barbara Wampler of Florida, is no longer available on the internet. The hat is identical to Barbara's bonnet pattern but with a small brim added. A similar gown, but with a draw sting base, is available from the Carewear site in their newsletter from June 06, but WARNING this is a large PDF file and will take a while to download depending on your connection. Page 27 onwards is the pattern in various sizes. The AC4C yahoo group has a similar pattern, in a smaller size, but with no waistcoat. I'm one of the many twentysomethings out there trying to make something of herself. I have a bachelor of music degree in piano performance from Penn State University (main campus) and a bachelor of science in nursing degree that I got through an accelerated second-degree program. I'm currently working towards obtaining my master's degree in nursing to become a pediatric nurse practitioner. It’s one of those things you do (or rather the OR staff does) at the end of a case. I usually continue to sew the last layer of skin as the count occurs. If there is ever a question, then I may help locate a “missing” sponge or lap. Usually (in my cases) they are just bunched together or one got tucked into the drapes. That will mean that the first “final” count was wrong, but the second “final” count correct. While cases of retained foreign objects are rare -- occurring once in every 5,000 surgeries -- discrepancies in counts happen in 13% of surgeries, according to an August Annals of Surgery study. I can honestly say, all the counts on all the surgeries I have ever done have been correct. No sponges, laps, needles, or instruments have been lost. My cases now are more organized than some of the major trauma cases I was involved in during my training. I can see how the counts were sometimes off. When you have what amounts to 2-3 different surgery teams (neuro, ortho, and gen surgery) all working on a single patient at the same time, it can get chaotic. In times like that, you sometimes wonder if the initial count was correct. In other words, sponges, laps, needles, etc don’t have to be lost for the final count (end of case) not to match the initial count (beginning of case). My fear of loosing a sponge in a breast case means I don’t use them. If they come in the pack, I ask the scrub tech to put them on the back field to be used as part of the dressing. Years ago, I finally managed to make the “the powers that be” see that if the count was correct, then it was wasteful to not use the clean sponges as part of the dressing. If an x-ray did need to be done for any reason in the recovery, I would happily just change the tagged sponges out for them. Hasn’t happened (knock on wood). I use lap sponges (see above photo) with the blue tags. This tag helps keep them from being lost. There is a push to get hospitals and surgery centers to buy gadgets (photo credit) like the SurgiCount's Safety-Sponge™ System featured recently over at Medgadget. The surgical sponges are individually bar-coded and then counted with the portable scanner. This would work nicely on scheduled cases, but I wonder how well it would work on those trauma cases when the sponges are needed three minutes ago. Would be interesting to see it in action on those cases. Sponges, surgical instruments miscounted in 13% of surgeries: Getting the count right in the operating room is a challenge. New technologies could make things easier. By Kevin B. O'Reilly, AMNews, Sept. 22/29, 2008. Anesthesiology resident, formerly from LDS country, now at the head of the bed in the eastern United States. Used to blog at Creating the Godcomplex. The deadline for submissions is midnight on Friday, October 24th. Be sure to submit your post via this form. I posted information on this shawl early last month. Well, I finally finished it and promptly gave it to my friend, Dr Val,. Here is a picture of the “blocking” process. The women at the Yarn Shop told me to put the shawl on a towel and use the steam setting on the iron. Just hold the iron near the shawl and give it a blast of steam. Here is the shawl after blocking it. It turned out pretty good. As a follow up to yesterday’s post on the new technique ARM, I thought I would repost this one from December 2007. FREE Lymphedema Alertband for the arm or leg are available here (photo credit)! The removal and analysis of the lymph nodes under the arm remains an important factor in determining the severity of disease in breast cancer patients, but can result in complications, including lymphedema of the arm. Lymphedema of the arm can occur in 5-50 % of patients depending on the extent of the dissection. The ARM technique was developed to try to prevent this complication. ARM stands from Axillary Reverse Mapping. This technique the way lymph fluid is drained from the arm rather than from the breast. The nodes that “light up” are preserved, therefore preserving the lymph system that drains the arm. "Mapping the drainage of the arm decreases the chances of unintended disruption of the lymph node system during surgery and reduces the risk of developing swelling in the arm," Klimberg said. "We are the first to study lymph node drainage in the arm and are now using the ARM procedure as standard procedure at UAMS." Clinical Trials such as this one at MD Anderson are being planned to test the validity of ARM’s claims to decrease lymphedema. Lymphazurin is a blue dye used usually in breast cancer surgery to trace the drainage pathway that flows to lymph nodes. The dye will travel to the lymph system and will end up in the lymph nodes that are draining the arm. In this study, lymphazurin will be used to find the drainage routes from your arm, rather than your breast. Before axillary lymph node surgery, your surgeon will inject lymphazurin into your arm. Your surgeon will watch how the dye flows and find the channels and nodes draining the arm. You will then have standard axillary lymph node (lymph nodes found under the arm) surgery. Any lymph nodes found that are dyed blue (lymph nodes that have traveled down the drainage pathways) that would normally be removed will be removed and sent to the pathology department. Pathologists will check the nodes to see if they have breast cancer cells in them. Also as part of routine care, all other axillary lymph nodes draining the breast will be removed and checked for breast cancer cells. This is an investigational study. Lymphazurin is FDA approved and commercially available. The use of lymphazurin with axillary reverse mapping is investigational. Up to 30 patients will take part in this study. All will be enrolled at M. D. Anderson. Axillary Reverse Mapping: Mapping and Preserving Arm Lymphatics May Be Important in Preventing Lymphedema During Sentinel Lymph Node Biopsy; J Am Coll Surg. 2008 May; Boneti C, Korourian S, Bland K, Cox K, Adkins LL, Henry-Tillman RS, Klimberg VS. Updated 3/2017 -- video and all links (except to my own posts) removed as many no longer active and it was easier than checking each one. There are many major systematic reasons for poverty. The Global Fund combats AIDS, Tuberculosis, and malaria which have a crippling effect on the fight against poverty. In 2008 The Global Fund is the official Blog Action Day charity. You are encourage bloggers to donate to this organization. T, Notes of an Anesthesioboist, is this week's host of Grand Rounds. Nice edition! Thanks for including my post. You can read it here. Via a twitter from Scan Man: India's surrogate mother industry A moral & ethical minefield of which he doesn't approve. I think it’s a tough position for those Indian women to be in. One I’m glad I’m not in. Childless Asian couples from Britain are increasingly travelling to India to pay women to act as surrogate mothers for them. In a country where there are no laws surrounding surrogacy, the industry has become a multi-million dollar business. A video from the Centers for Disease Control and Prevention (CDC) who along with Families Fighting Flu, Inc. (FFF) has launched a compelling video documentary via YouTube. Please, get your children and yourself vaccinated for the flu vaccine. For more information about the flu and the influenza vaccine, please visit the CDC website or Families Fighting Flu’s website. Via ShadowFax and Uveal Blues, some amazing high-speed pics of stuff getting shot or smashed. I agree, it makes for some beautiful pictures (photo credit). For some less than beautiful effects of bullets, check out Bongi’s post, tumble. Do you or someone you know need a new camera strap or maybe just a funky one? Well, the Stitching Surgeon shows off the one she made for her sister (photo credit). The Dr Anonymous' Blog Talk Radio show this week will be about Podcamp Pittsburgh. Last October, I wrote this post on Mammograms. I am reposting it today. First, please, refer to my post on breast self-exam. It is important to do your monthly self-exam. It is important to do it properly. Also, check out this article on breast changes during your lifetime that are not cancer from the National Cancer Institute. Mammography can show changes in the breast up to two years before a patient or physician can feel them. Cure rates are much higher when the breast cancer can be found at this stage. Current guidelines from the U.S. Department of Health and Human Services (HHS), the American Cancer Society (ACS), the American Medical Association (AMA) and the American College of Radiology (ACR) recommend screening mammography every year for women, beginning at age 40. Diagnostic mammography is used to evaluate a patient with abnormal clinical findings—such as a breast lump or lumps—that have been found by her or her doctor. Diagnostic mammography may also be done after an abnormal screening mammography in order to determine the cause of the area of concern on the screening exam. Before scheduling a mammogram, discuss any new findings or problems in your breasts with your doctor. At the time of the mammogram, inform the radiologist (or the techs) of any prior surgeries, hormone use, and family or personal history of breast cancer. Try not to schedule your mammogram for the week before your period if your breasts are usually tender during this time. The best time for a mammogram is one week following your period. Always inform your doctor or x-ray technologist if there is any possibility that you are pregnant. If possible, obtain prior mammograms and make them available to the radiologist at the time of the current exam. Or try to use the same facility each year so they will already have prior mammograms. Ask when your results will be available; do not assume the results are normal if you do not hear from your doctor or the mammography facility. Make sure you state who should get a copy of your mammogram results--family doctor, general surgeon, oncologist, plastic surgeon, etc. The radiologist will look at your x-rays for breast changes that do not look normal. The doctor will look for differences between your breasts. He or she will compare your past mammograms with your most recent one to check for changes. The doctor will also look for lumps and calcifications. Macrocalcifications are large calcium deposits often caused by aging. These are usually not cancer. Depending on how many calcium specks you have, how big they are, and what they look like, your doctor may suggest that you--1) have a different type of mammogram that allows the radiologist to have a closer look at the area, 2) have another screening mammogram, usually within 6 months, or 3) have a biopsy done. Mammograms are not perfect, but are currently the best method to find breast changes. If your mammogram shows a change in your breast, sometimes other tests will be needed to better understand it. These follow-up tests include ultrasound or more mammograms views. The only way to find out if an abnormal result is cancer is to do a biopsy. It is important to know that most abnormal findings are not cancer. Welcome to the latest edition of SurgeXperiences! Fall is here in the northern hemisphere. The leaves are being to turn colors and the air is cooler. Perfect for a nice walk in the woods (don't forget the hunter orange) with my dog. I’ll leave this “bounty” of good writing for you to read at your leisure. Enjoy! How do you answer the question "are you thinking about specializing some day?" when you tell someone you are a general surgeon? Bongi tells about his response here. Then read on as Bongi tells you how bullets can tumble and create unimagined damage to a person’s insides. i know a bit about ballistics. it's more practical knowledge. i've seen enough gunshot wounds to pick up something here and there. the high velocity ones wreak havoc inside. the more usual 9mm doesn't compare but a well placed shot is still devastating. and then you get the exceptions. ricochet shots can be confusing. they tend to take strange paths through the body, sometimes following dissection planes (like surgeons) and causing less damage than you'd expect. and then you get the tumbler………. Tumble reminded Quietus, The Sandman, of his own post, the new math. ……….Ruminating on the case, I became enlightened as to how the "new math" is done in Gaza. I'm reminded of Milo Minderbinder, a character from my favorite book "Catch-22." The character is a mess officer during WW II who turns the war into a lucrative business. He buys eggs at a high price and sells at a low price and still manages to make a profit in a dizzying transfer of goods all over the Mediterranean. This Gazan did the same thing, except with his life………. He also gave us a post on APBI verse whole breast radiation in Mammosite, but perhaps the most personal recent post was the one on a needle stick. Bongi recently had a post about an experience getting stuck by a needle while operating on an HIV positive patient. It reminded me of a time during my residency I had forgotten………. There was something powerfully existential and substantive about it all. Rarely do we visit those dark places of the soul where our ultimate weaknesses are exposed. Rarely do we acknowledge our ineluctable mortality. It's too much. It throws us off our fragile equilibrium. There's too much to do in the here and now. But the time will come for all of us. The day of reckoning is unavoidable………. T, Notes of an Anesthesioboist, writes about the doctors superstitions in one of her many thoughtful posts. Whenever a patient says that my wariness increases a bit. It's doctor-superstition, I suppose, but it's been said that when patients have a feeling they're going to die, it's because...they're going to die. But I was hoping this was just her extreme nervousness talking rather than an actual sense of impending doom. T writes movingly about the need to “before dying, leave word” about your end of life wishes. Normally, getting asked to do an intubation in the ICU is one of the most satisfying parts of my job. I feel like I'm being asked for help….. and the task is potentially life-saving. …..But this one made me terribly sad…………We felt our hands were tied. Chris and Drew, Pallimed, have written a nice post -- "Brain Death 40 years on"
But variations in the definitions and use of "brain death" in an era of increasing demands for organ donation raise important ethical, legal, and practical questions. Last year Christian briefly blogged on organ donation after cardiac death. According to the Economist.com article, cardiac-dead donors is the fastest growing proportion of donors……..
Bruce, Reflections in a Head Mirror, writes two thoughtful posts. The first speaks to the "interval between the biopsy and the report". There is a time of limbo in Medicine that begins when the procedure is completed and ends when the patient learns the results. It occurs millions of times each year after everything from major surgeries to blood tests. Although it was not the point of her essay this week in The New York Times, Dr. Paula Chen touched on these moments as a friend's father waited for the results of a pancreatic biopsy. Dr Pauline Chen writes about The Dance Before the Diagnosis and says “The diagnosis was in their body language.” Also, check out her blog here. Bruce’s second post addresses the "naked truth about tonsil cancer". “Doctor, I should not have cancer! I never smoked! I am only 45 years old! It doesn’t make sense!” The patient and his wife sit stunned and frightened. My new patient is absolutely correct … he does not fit the traditional profile of patients with cancer of the tonsil. Also check out this NY Times article transplant surgeon Dr Pauline Chen wrote (via Kevin MD) – The Choices Patients Make. There are certain choices patients make that I have never understood, choices that from my perspective as a doctor seem to undermine their very chances for survival. Or at least undermine the efforts doctors, nurses and even complete strangers make on their behalf. ……….. I asked Ms. Silverstein about how she had dealt with such pressure. Jeffrey, Monash Medical Student, writes a nice post “to err medically”. Something none of us wish to do. Prompted by Dr Val’s guest post at other things amanzi, i’m reminded of a story my surgical professor recently told us, during his tutorial on fluids and electrolytes management in surgical patients. Quite some time ago, a patient was in the hospital had a percutaneous endoscopic gastrostomy (PEG) tube in for some reason or other………….. It didn’t make me any more enthusiastic that the picture I got from the chart before going into the room was of a patient seeking pain medication. Sure, she had a couple genuine chronic conditions with biopsy documentation of their existence; but she was on a lot of narcotics, plus some valium thrown in. She had been on disability for years, even before this most recent, serious problem cropped up. I was in for a surprise………. Dr B (surgery, cooking, art...life. passionately) writes that "finger dislocations are REALLY easy to reduce if they are gotten to in time". "Reduce...? It looked less swollen and better, so I sent him home." You've GOT to be kidding me. That is what I wanted to scream into the phone, but I kept my composure. I am not proud. I am, in fact, rather ashamed. But the other emotions I feel are anger, distaste, and, quite frankly, dread. I took the gentleman from this post to the OR last week... last Monday, to be exact………. Did you know Bruce has a second blog, Behind the Head Mirror? he says its for the stuff that doesn’t fit his other blog. Both are excellent! Check out this post comparing training surgeons to teaching kids to drive. Driving a car is a lot like learning to be a surgeon. No matter what you might believe, you begin by being completely incompetent; neither driving nor surgery is intuitive. You learn incrementally and develop skills. You find out how to get out of jams and tight spots. You learn to anticipate what might happen and make adjustments. You develop the ability to to plan three or four steps ahead. This Little Owl talks about experiences as a medical student on her surgical rotations. All in all positive, so we may have another surgeon in the mix. You can read her take in Surgery Clerkship Highlights. Like I said previously, I intended to keep track of my experiences this year, so it’s time to play catch up. I started the clerkship on June 30 and ended on September 19. I worked with several groups: pediatric surgery, ENT (ears, nose and throat = otolaryngology), the surgical consultation service (mostly hepatobiliary surgeries), and the dedicated hepatobiliary service………………. Saif writes about his experience observing a radical prostatectomy while in Oaxaca. He is an undergraduate at UC Davis who hopes to be a doctor someday. After this experience, perhaps a surgeon. From Scan Man’s casebook, a post with films on a major renal trauma from a fall and another on infantile hemangioendothelioma. Very impressive films! Go check out the rest of them along with his explanations. A tweet from Scan Man after “Successfully hydroreduced an ileocolic intussusception in a 7-month old child. Maintaining my 100% record.” It is a very nice article. Shadowfax, Movin’ Meat, posted on something you don’t see everyday. Thankfully, we don’t. The films, once again, are impressive and involve “a trauma patient who was in her third trimester of pregnancy”. 911Doc, M.D.O.D. (photo credit), wrote a couple of nice ER tales on patients who needed surgery. The first is Coup-Contra-Coup (what's a helmet?) and the second is In a Word..."Balls". Dr Oliver, Plastic Surgery 101, asks "Does it make sense to screen asymptomatic breast implant with MRI?" and then answers it for us. One of the peculiarities of the USFDA process during silicone implant reintroduction in 2006 was the labeling on the devices recommending routine MRI surveillance of implants for rupture. When you step back and look at the proceedings and "unique" American history with breast implants, you can see that this was more a political concession to the anti-implant activist lobby then evidence-based medicine. The FDA labeling currently suggests MRI's at 3 years post op and then every 2 years subsequently. It will be interesting with the coming form stable "gummy bear" implants whether or not this recommendation is still maintained…………. This is the story of how I ended up working as a medical photographer. It’s not a very long, but quite winding road, that turned out to come almost full circle. He is as Norwegian medical photographer and if you haven’t seen any of his videos of surgery he shares on his blog, then check out these posts and this one. Dr Val (check out her new blog: Getting Better with Dr Val) writes about MRgFUS. A heart warming story from John Pages, Cebu Sports Blog, who enter the Hong Kong marathon but didn’t finish due to leg cramps. The post is about a heart surgeon, Peter Mancao, who stopped to help him rather than just running past. Make Mine Trauma, IntraOporate, gives us an oldie but goodie that shares a day in the life of a trauma junkie. As you may recall I was lamenting on Monday about not getting any trauma or on call action. Here's how my other night went. Phone rings at 2150 hrs. Would you like to assist on an ex-lap for blunt trauma? Of course I would because that is what I live for. David Harlow, Health Care Law Blog, writes about his interview of Douglas S. Brown, General Counsel, UMass Memorial Health Care and the reinvention of their Cardiac Surgery program. YourNewBodyBlog.com features two Beverly Hills plastic surgeons, Dr. Stuart Linder (“BodyDocBlogger”) and Dr. Robert Kotler (“FaceDocBlogger”). In a recent post, they discuss 10 Things that can go wrong in plastic surgery. HerniaSymptomsBlog has a post that reviews Abdominal Hernia Symptoms and Treatments. Begin here and then read the multiple post that follow as Annika’s mom “live blogs” her liver transplant. We got a call this morning: a new liver for Annika. That needs an exclamation point, but I'm too nervous. Please please please keep her safe. Please please please send peace to this donor family. BuffaloesAreWild writes about Waiting in the Hospital and his attempt to learn patience. Leslie, Room for One More, writes “She’s Out of Surgery”, a post about her adoptive daughter undergoing cleft lip surgery. Dr Jerry Elrod, Senior Moments, writes from a personal viewpoint about prostate cancer: surgery and its side effects. Another tips from Scan Man, the University of Virginia Health System website has a very nice article with pictures (scalpels, credit) on Surgical Instruments from Ancient Rome. If you like medical/surgical history, you’ll want to check it out. Crossway.blog has an interview with Dr Harry Kraus who is a practicing surgeon and a missionary with Africa Inland Mission. He is the author of eleven novels and two works of nonfiction, including Crossway’s Breathing Grace and The Cure. Medgadget reports on the first man to get a double arm transplant (photo credit). The next edition of SurgeXperiences (209) will be hosted by Resident Anesthesiology Guy at his blog "The Choloform RAG" on 26 Oct, 2 weeks from now. Be sure to submit your post via this form. Today is the Race for the Cure here in Little Rock, Arkansas. 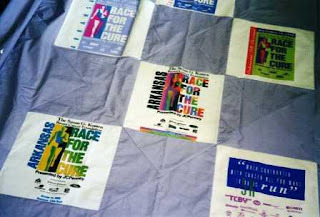 It is the 15th year for the race. I participated in the first 10, but then it grew so much that I now feel claustrophobic in the crowd. The growth is a good thing, but I now choose to donate rather than get crushed. Check out this video of last years race. One of the good things about this blog is that it has encouraged me to take more (better?) pictures of my quilts than I did. 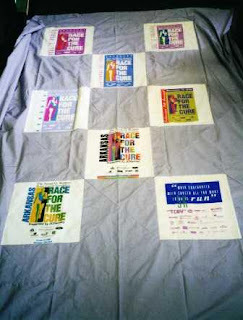 In 2001, I made a quilt from my race t-shirts and donated it to be used in a Silent Auction. I don’t recall how much they made, but don’t think it was more than a few hundred dollars. 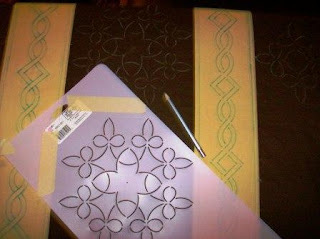 I found these two pictures of the quilt top prior to it being quilted. I guess I don’t have any of the finished quilt. I don’t recall the exact measurements, but would guess that it was something like 65 in X 85 in. I did get a very nice thank you card/note from the woman who won it. She was a breast cancer survivor who in 1997 had a had mastectomy followed by chemotherapy and radiation. At the time of the note, she was still cancer free. I hope she remains in good health.